Ki Pro Quad enables 4K/UltraHD/2K/HD workflows with efficient Apple ProRes capture and playback in a compact, file based recording and playback device that easily mounts directly behind a variety of cameras. Ki Pro Quad serves as a central gathering point for the main needs of 4K production; capture efficient, edit friendly 4K Apple ProRes files with pristine image quality and output to 4K and HD monitors with real time down conversion simultaneously. Work on HD and 2K resolution projects now with full 4:4:4 or 4:2:2 quality and switch Ki Pro Quad to record 4K any time the need arises. Ki Pro Quad covers your portable recording and playback needs today and into the future. Enables a powerful yet manageable workflow for 4K. Ki Pro Quad serves as a central gathering point for the main needs of 4K production; bring camera signals into Ki Pro Quad and then simultaneously create edit friendly 4K ProRes files, output to 4K monitors and record Raw data directly to Thunderbolt enabled computer/storage system. 4K content needs are growing. Ki Pro Quad helps ease the transition to 4K with a recorder that creates smaller file sizes while still retaining quality. Supports 4:2:2 and 4:4:4 recording even at HD and 2K resolutions. Real time scaling from 4K to 2K/HD. Shoot 4K but record 2K to keep file sizes down but still have theatrical quality images to work with. HDMI output allows connection even to HD consumer monitors. Ki Pro Quad can cover your needs today and into the future. New hardware based features, such as real time, high quality Raw debayering, recording directly to 4K resolution Apple ProRes files and real time scaling from 4K to HD. Only AJA can deliver advanced features like these in such a compact package. Ki Pro Quad is priced substantially less than other 4K recorders but still has the power and functionality for the demands of 4K productions as well as functionality not found in recorders of ANY price. Ki Pro Quad follows the same tried and true principles that have made the rest of the Ki Pro family successful, creating high quality, low bandwidth ProRes files up to 4K resolutions, that can be easily offloaded to a Thunderbolt or USB 3.0 enabled computer via AJA's Pak Dock SSD media reader. The resolution may be different, but the process is the same. And with the same capabilities of Ki Pro Mini for remote control, automation, ease of use and mounting options, the transition to Ki Pro Quad is virtually seamless. Ki Pro Quad includes Ki Protect, a feature that helps to ensure data integrity if a media drive is accidentally removed or loses power during recording. The Ki Protect feature automatically pre-allocates recording space on the media drive for video, audio and timecode when the record button is pressed. While recording, the file header is then continuously updated every time new data is written. That way, the only loss that should be incurred is the last few frames that were in transit to the media drive to be recorded when the operation was interrupted. Frames that are already recorded will be preserved and are recoverable, providing greater peace-of-mind on set and in the studio. At 4K resolution, the ability to check focus and exposure is critical. The only way to do this is with proper, full 4K monitoring. Ki Pro Quad provides a full resolution output that can be fed to 4K monitors for real time, on set quality checks. Real time hardware scaling creates high quality HD-SDI and HDMI outputs for viewing on consumer and professional HD monitors, giving you additional options. Raw data is the source from which all other image formats can be generated. This is the equivalent of a camera negative in film terms. Thunderbolt allows the bandwidth to record this Raw data via a single cable to a properly configured drive array. Ki Pro Quad supports Raw data pass-through while simultaneously recording to 4K ProRes files, for the ultimate in data security and flexibility. 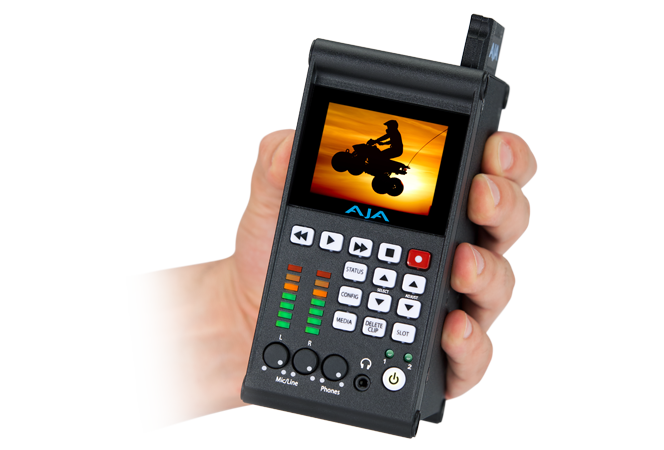 The screen on the Ki Pro Quad is located on the same side as all of the user controls so that both the screen and controls are fully accessible even when the Ki Pro Quad is mounted to the camera along with other gear. This provides a quick reference of the input signal as well as the configuration menus. The current status of the Ki Pro Quad, as well as all the configuration information, is displayed on the built-in screen. 4K cameras are no longer giant pieces of machinery. They are as mobile as an HD camera and need a recording device that matches. Ki Pro Quad has the same side profile as the AJA Ki Pro Mini, so the same mounting accessories such as the Mini Mounting Plate can be used to mount the Ki Pro Quad to cameras, rails or whatever the situation calls for. AJA’s technical support is recognized as among the best in the industry and is available to all AJA customers. If you need assistance with any aspect of your Ki Pro installation, configuration, operation or encounter any technical issue, AJA Support will work with you to get up and running. Ki Pro products are covered by a generous three year international warranty. Ki Pro Quad lets you record edit-friendly 4K, 2K, or HD ProRes files directly to removable AJA Pak Media. Once removed from the Ki Pro Quad, the Pak can be inserted in the AJA Pak Dock which connects directly to your computer via Thunderbolt ™ or USB3, allowing you to rapidly transfer ProRes files that are ready for use immediately in your non-linear editing system. External Pak Dock with Thunderbolt™ and USB3 connections for fast transfer of media to a host computer. Pak Media is a high-capacity solid state drive encased in a protective housing with rugged connection engineered to handle the rigors of repeated use in the field and is available in 256GB/512GB and 1TB as Pak256, Pak512 and Pak1000 respectively. Pak-Adapt-CFast allows you to use CFast media with Ki Pro Quad. Simply insert the CFast card and once the green LED is lit, your media is mounted and can be formatted. You’re then able to record direct to your media. You can even mix and match AJA Pak media side by side with Pak-Adapt-CFast if needed. Pak-Adapt-CFast requires qualified media to ensure you get the best results. Although most types of CFast media will mount, only qualified media will provide proven performance. Ki Pro Quad has the exact same side dimensions as Ki Pro Mini, allowing both models to share accessories such as the Mini Mounting Plate. This option plate allows you to mount Ki Pro Quad to 3rd-party devices. The plate is attached via 4 supplied screws; plates can be attached to either or both sides of Ki Pro Quad. A large number of screw holes in the plate allows you to mate Ki Pro Quad to 3rd-Party battery plates, hot-shoe adapters and other mounting applications. This stand securely holds the Ki Pro Quad upright on a desk, shelf, or any flat surface. A right angle power cable is provided for easy connection between the power supply and the Ki Pro Quad. This option, which is interchangeable with Ki Pro Mini, provides an accessory plate that can attach to a Mini Mounting Plate (sold separately) so you can attach Ki Pro Quad to user-supplied 15mm camera accessory rods. The accessory plate has knobs for adjusting the height of the rods relative to the Mini Mounting Plate, as well as a set of knobs for securing the rods in the bracket. For working in direct light situations, a monitor hood is included that screws onto the Ki Pro Quad chassis for a secure fit that helps block direct light onto the built-in confidence monitor.